Here’s a little sneak-peek at one of my upcoming designs. As I mentioned in this post, I contracted Koigu Fever a few months ago. I finished the Charlotte’s Web shawl that started it, but I still itched to work with Koigu, so I started playing around with the idea of making a blanket of crocheted Koigu hexagons. After some trial and error, I finally hit on a winning design, and the above photo shows the fruits of my labor thus far. I’m calling it Bonbon, since each little motif takes less than fifteen minutes to whip up. 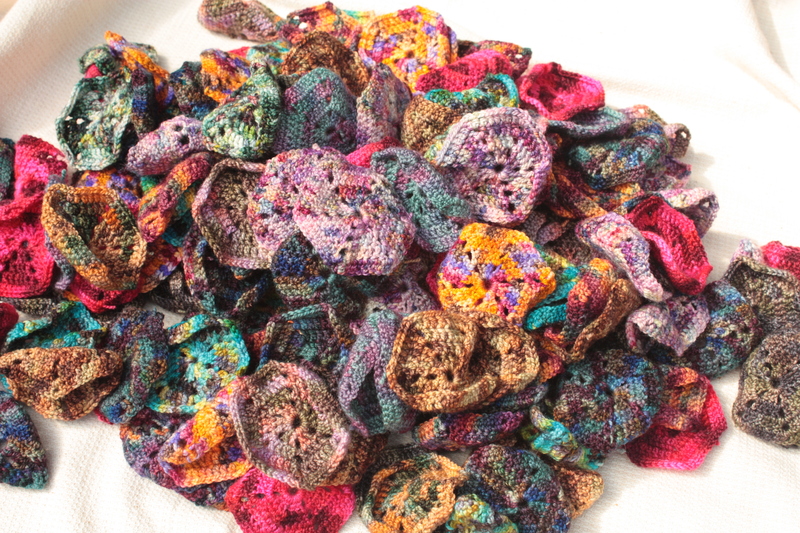 Really, every hexabon (hexagon + bonbon = hexabon) is like a little morsel of yarn-y goodness! And, like the sweet treats that they’re named for, it’s hard to do just one (I’m at 197 right now!). Simple enough for beginning crocheters yet interesting enough for those with more advanced skills, Bonbon is sure to be a crowd-pleaser. Stay tuned for more info! Is there a calorie count for these bonbons? When can I learn to make them? Got the crochet bug at class on Friday. Thanks to Amanda, I think. My goal is to have the pattern ready by September 1st. No calorie count, unless you use the reward system with real bonbons. Yes, the hexagons will continue and multiply just like rabbits! Just don’t run water over them or feed them after midnight. You don’t want gremlins!